President Trump Faces An Early Foreign Policy Test After A Gas Attack In Syria The situation in Syria also raises questions about Trump's support for autocracies and authoritarian regimes — and whether he can lead the world with moral clarity and authority. 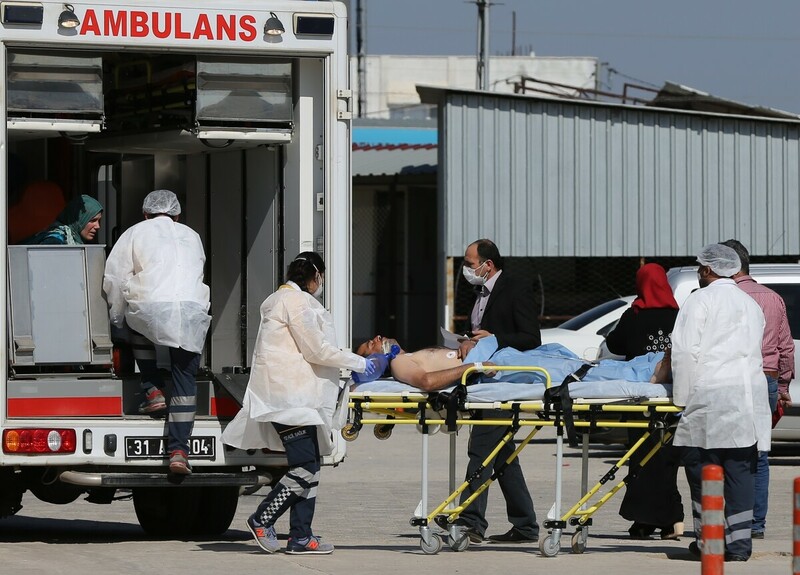 An injured Syrian man is taken to Reyhanli State Hospital in Hatay, Turkey, on Tuesday. A suspected chemical attack took place in Idlib, Syria. President Trump issued a remarkable statement following a Syrian gas attack U.S. officials say was leveled by that country's leader against his own people. Some 40 words of the short, 78-word statement blamed former President Barack Obama for inaction. "These heinous actions by the Bashar al-Assad regime are a consequence of the past administration's weakness and irresolution," the statement read, in part. "President Obama said in 2012 that he would establish a 'red line' against the use of chemical weapons and then did nothing." Obama's declining to act when Syrian President Assad crossed the "red line" was arguably the low point of Obama's presidency when it came to his handling of foreign policy. But it's not like Trump called for action back then — just the opposite, as NPR's Tamara Keith reports. And Trump is not calling for action now, even after an attack that killed dozens, with horrific images emerging. The new American president is being tested on the world stage, as this attack comes just days after the White House said Assad's ouster is not its priority. It also raises questions about Trump's support for autocracies and authoritarian regimes — and whether he can lead the world with moral clarity and authority as U.S. presidents have done for decades. On Wednesday, Trump meets with another key player in the Middle East — Jordan's King Abdullah, an ally who is more important than ever. White House press secretary Sean Spicer said Friday that Assad in power is a "political reality that we have to accept." U.N. Ambassador Nikki Haley said "been there, done that" when it comes to demanding Assad step aside. Secretary of State Rex Tillerson has said the "long-term status of Assad will be determined by the Syrian people." There are mixed messages, however, coming out of the White House. Spicer also said the administration wants to see a de-escalation of violence. That didn't happen. Instead, Syria upped the ante. Haley called Assad a "big hindrance to peace" a week ago and said, "When you have a leader who will go so far as [to] use chemical weapons on their own people you have to wonder if that's somebody you can even work with." Two days ago, she went so far as to call him "disgusting" and a "war criminal." Assad went ahead and used those weapons again anyway, according to U.S. officials. Russia has been aiding Syria and helping conduct airstrikes as well. Both countries deny that they used chemical weapons. They say they hit a cache of rebel weapons that then leaked. U.S. officials aren't buying that. Trump's reaction also raises more questions about his support for autocracies around the world. Throughout the campaign, Trump praised Russian President Vladimir Putin while criticizing Obama and "stupid" American leaders. As president, he defended Putin last month in an interview with Fox's Bill O'Reilly. When O'Reilly said Putin was a "killer," Trump responded, "You think our country's so innocent?" Just two days ago, Trump not only met with but praised Egypt's president, Abdel-Fattah el-Sissi. "We agree on so many things," Trump told assembled reporters and television cameras during a meeting at the White House with the Egyptian leader. "I just want to let everybody know that we are very much behind President el-Sissi. He's done a fantastic job in a very difficult situation." He said Egypt and Sissi had the United States' "strong" backing. Sissi is a former military general, installed as Egypt's president after a bloody coup, whom President Obama refused to meet with because of concerns over human rights abuses, including jailing dissidents and accusations of torture, murder and kidnapping. Trump gave Sissi exactly what he wanted — legitimization. Putin has called on the U.S. to shift and get off its moral high horse in the name of stability. Trump's "America First" doctrine appears to go along with that. There are a lot of strange bedfellows when it comes to fighting ISIS. Remember, the Obama administration coordinated with Iran, and there were and remain questions about Iranian influence in Iraq. But the question is — what does Trump do now that he is president? Republican Sen. John McCain was highly critical of the way Trump has handled this. "Bashar al-Assad and his friends the Russians take note of what Americans say," McCain told CNN Tuesday. "I'm sure they are encouraged to know the United States is withdrawing and seeking a new arrangement with the Russians." He criticized Obama's response, too, and says this is a "disgraceful chapter in American history." McCain, though, is an interventionist. In addition to calling for arming Syrian rebels and for Assad's ouster, he also wants to see Russia "pay a price." What would that mean, and would the American people really be on board with that? Obama's calculation was that after the Iraq War, without true multilateralism and without help from major world powers, nation-building and unilateral intervention in the Middle East was not in the U.S.'s best interest. Trump wants to fight ISIS and has called for working with Russia and Syria to do that. But the strategy — if there is one — is less than clear. The White House says, per NPR's Keith, that Trump will be meeting with his national security team and that the administration is not yet ready to talk about next steps, though it is promising to get there soon. As NPR's Tom Bowman noted in NPR's new podcast Up First from Morning Edition, Trump could take out Syrian aircraft on his own, but it's unlikely he will. The focus, instead, is on ISIS and to try to work a political settlement on Syria if the opportunity presents itself. Tone and rhetoric aside, that actually sounds remarkably similar to what Obama was doing. One thing is clear: Trump will continue to be tested by America's adversaries, especially in these early days of his presidency. They want to feel him out, see what he will act on and what he will back away from when it comes to that bombast. Just Tuesday night, for example, North Korea launched another ballistic missile into the Sea of Japan. That comes just a day before Trump is set to meet with China's President Xi at his Mar-a-Lago club in Florida. Trump promised during the campaign to be unpredictable. The world is still waiting to see how he will lead on the world stage.